I was just perusing my favorite online computer retailer, Newegg.com and I was greeted with a pleasant surprise. The main page loaded up just the way it normally does, but when I clicked the details on a laptop, the site greeted me with a brand new set of navigation menus and a spiced up UI. I also took note that I had been bounced to a www2 prefix instead of the normal www. When I went back to the main page, it too had transformed. I must say that it’s about time this retailer took a look at its front end and said “Hey, this looks like 1999 took a dump on our website.” The choice to go with a soft cream instead of solid white for the background is a major plus and the beveled lines on the navigation menus look really classy too. Once you click a thumbnail to view an image more closely, you’ll notice that the detailed view has received an overhaul as well. The sections are defined with color blocks (finally) so discerning what it is you’re actually looking at has become a lot easier. After looking at a few items, you’ll notice that the sidebar of the navigation menu has accrued a list of the things you’ve just looked at. This is unassailably cool. For those of us who are slaves to our five button mice, relying solely on your browser’s history isn’t always the best idea. Now that Newegg caches these things on the fly, you can zip on back to another item to compare it without having to search all over again. Finally, make sure you take advantage of Newegg’s “New Newegg Launch Specials”. I’m sure there are some deals to be had there. Google Maps’ new satellite view is causing quite a stir on the ‘net as of late. People haven’t had this much fun getting directions from Point A to Point B since Mapquest first came out. If you don’t have Photoshop, I’m sure other image editing applications will work. I simply chose Photoshop because I’m familiar with it. Ok, so let’s get down to business. First, find your city on Google Maps. I just typed in my home address and it brought me straight to it. 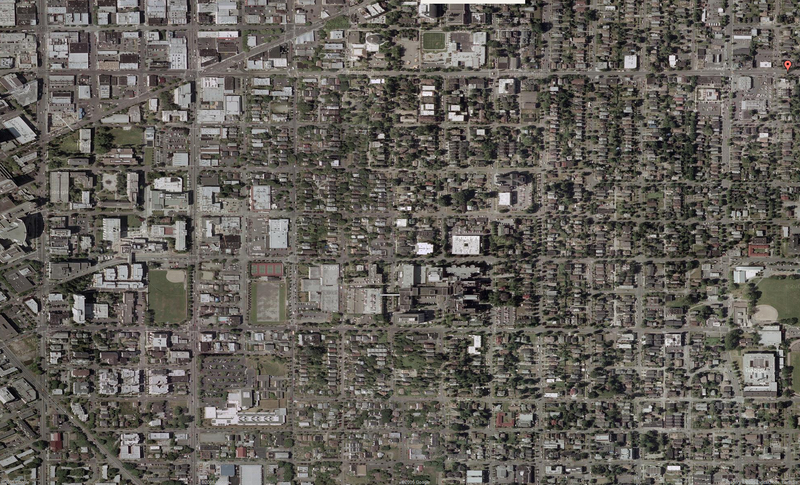 Next, switch to satellite view so you can get a lay of the land and zoom in as far as you can. Now you’re ready to make a huge map of your city. Make sure the window is maximized so you get the biggest map area possible in each screenshot. Then, hold ALT and Print Screen (OPTION SHIFT 4 on a Macintosh). This will take a screenshot of the currently focused window and put that screenshot in your clipboard. Now go over to Photoshop and hit CTRL N to make a new canvas. You’ll notice that the canvas size is the same size of your browser’s window. Photoshop is smart like that. In your new canvas, hit CTRL V to paste in your screenshot. This canvas is going to be our toolbox for getting our map on its feet. Go to the selection tool in Photoshop (keyboard shortcut M) and zoom in on the screenshot a little bit so you can be precise (keyboard shortcut CTRL +). Now, click select the entire map area, excluding the 1px light grey border and the controls. Now you have your base selection that you will use again and again as you make your map. In order to re-use this selection again and again, we’ll need to save it. Go to Photoshop’s menu at the top and click “Select” then “Save Selection”. Leave all of the settings as they are, but name your selection something you’ll remember. I chose to name mine “map”. Ok, so now that your map selection is done, go ahead and copy it (keyboard shortcut CTRL C) and make a new canvas. Paste the new selection into your canvas and you’ve just made your first part of larger things to come. This canvas is far too small for an entire city to fit, so we’ll need to resize the canvas. Go to Photoshop’s menu again and click “Image” then “Canvas Size”. Resize your canvas 300 percent in both width and height and anchor your existing piece to the top of the canvas (or to the bottom if you plan on making a map to the North). Ah, that’s better. A ton of space to work with. Now go back to your browser, advance the map in any direction, and screenshot (ALT PRINT SCREEN) a new piece of the map. Google Maps’ advance buttons don’t move one full frame per step, so you will have overlapping sections (and that’s ok). Just know that when you advance to the right one step and take a screenshot, you will be saving redundant map areas. Remember the original canvas we made in Photoshop with our first screenshot? Go back to that canvas and paste in your new screenshot. You’ll notice that when you paste in the screenshot, it will have removed your previous selection, but that’s why we saved it in the first place. Go to Photoshop’s menu and click “Select” and then “Load Selection”. Click the “Channel” drop down menu and find your selection that you made. Voila, it’s back! Now you can simply copy the selection and paste it into your other canvas (the huge one, remember?). Now the tricky part to adding new sections to your map is lining them up exactly. Since you’re probably looking at city streets, lining those up is pretty simple (except in Seattle where I live… the streets curve all the time for no reason). Try to line up landmarks that you will recognize and the map will come together in a snap. 1) Advance the map in the desired direction. 2) Take a screenshot of the window (ALT PRINT SCREEN). 3) Paste the screenshot into your first canvas. 4) Load your selection and copy it. 5) Paste your selection into the second canvas and line it up. It’s pretty easy once you get the hang of it. Also, if you want to put in little markers for certain addresses, just do another search for that address and take a screenshot of the map like you would for any other map section. Then you can paste that map area into your canvas and have a marker for that address. Finally, here is my example map that I did of the area around Seattle University. In the wake of EasyTree’s closure, I got to talking with some friends about the nature of share ratios in regards to Bittorrent. When Bittorrent first launched, all of the trackers were just pages and pages of *.torrent files that anyone could access. As it became apparent that the nature of people is to take take take and not give back, torrent trackers saw it necessary to devise membership schemes with share ratio requirements in order to keep users in check. But what happens when a tracker is taken down? What is your share ratio worth then? Not a thing. I’ll admit, when EasyTree went down my share ratio was 0.26; almost the bare minimum ratio you can have and still download files. I believe I had something along the lines of 130 gb downloaded and 34 gb uploaded. But what did it matter? The site was gone and I had plenty of live shows to show for it. The saps who spent hours and hours maintaining their 1.0 share ratio had nothing to show for their work. What I’m getting at is the idea of global share ratios. What if there was a portal where everyone could create an identity and then every tracker they downloaded from would report their share ratio back to the portal. Obviously such a scheme would require cooperation from all of the trackers, but think of the effects such a system could have. Certainly there are limitations and complications to such a system. How would the portal keep individuals from registering new identities as they leech their way to dismal share ratios? How much bandwidth would the portal need access to in order to receive all of this data from so many trackers on the Internet? How much more bandwidth would trackers need to use in order to report the data to the portal? The idea is very similar to how Counter-Strike (and other Half-Life mods) servers dealt with the problem of hackers when it became apparent that the problem was rampant: create a global blacklist to be shared amongst all of the servers. If the person’s ID is banned one server, it’s banned on all of them. Same idea, different arena.